Oakland Creek to Bay Day is part of California Coastal Cleanup Day, the largest volunteer day in California and the world – when thousands of volunteers beautify and clean trash from shorelines and waterways across California, the nation and in about 100 countries. 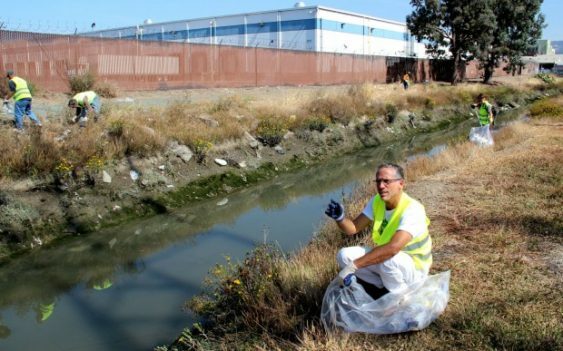 Oakland Creek to Bay Day projects help clean and beautify Oakland’s creeks, shorelines and Lake Merritt. Local cleanups also help keep trash out of San Francisco Bay, the oceans and our beaches. In addition, trash data from Creek to Bay Day helps strengthen pollution law and policy. Oakland Creek to Bay Day projects include trash removal, invasive plant removal and planting native plants. Groups of all ages are welcome to participate and are encouraged to gather friends, family and co-workers to have fun and help improve the health of our community and environment. Please note, pre-registration for individuals and small groups is not required, however please ensure all volunteers sign the waiver prior to starting and have them sent to adoptaspot@oaklandnet.com.